I was wondering why I wasn't getting any comments since I migrated my blog - so I went to test it and I saw that the comment entry info was getting cut off. I have fixed so now you can comment away! Hang in there! This migration has been bumpy but it's getting there! I am so happy I can now subscribe to you on Google Reader. I have been reading your blog forever (it was the first one I really read) and I love it. 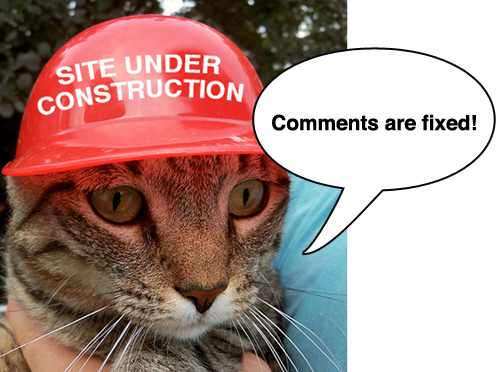 I left a comment mentioning your comments weren't working. I guess it was effective after all. lol. See, this is where you and I differ. I would've just said, "Forget it." Glad you are making a comeback though.